David Hockaday. Picture: Jonathan Gawthorpe. FORMER LEEDS United head coach David Hockaday has expressed his desire to re-enter the coaching realm in the Football League - speaking publicly for the first time since being axed by Massimo Cellino at the end of August. Hockaday, 57, a hugely controversial choice when he was named as United’s permanent head coach in the summer - despite his only previous experience as a manager coming in the Conference at Forest Green - returned to his Wiltshire home after parting company with Leeds after just 70 days in charge. His final game was the televised Capital One Cup derby reverse at League One neighbours Bradford City on August 27, with the former Swindon and Hull defender winning twice in six matches in charge at Elland Road. 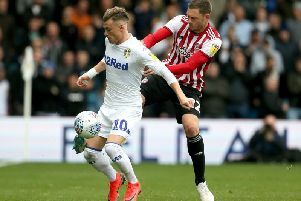 He recently linked up with non-league outfit Swindon Supermarine, but admits he is eager to secure employment at a professional club again in the near-future and has not been put off by his tough experiences at Leeds. On his exit on August 28, he said: “It’s football, it is the business we are in and I am now looking to get back into the Football League. “I now have a mountain of experience behind me, coaching is my passion that is what I want to do and that is where I am looking to get back into as soon as possible. “So for the last few weeks, I have been starting to network strongly and get my CV back out there and hopefully something will happen for me sooner rather than later.